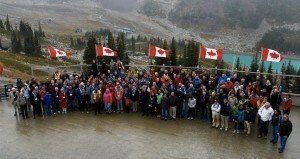 The Linear Collider Workshop (LCWS2015) will be held, at Whistler, BC, Canada, in November, this year. The 17th International Conference on RF Superconductivity (SRF2015) was held in the same place from 13 to 18, September, just prior to the LCWS. We would thank TRIUMF hosting two major conference/workshop events at the nicest village surrounded by beautiful mountains and great nature. SRF2015 covered the latest advances in the science, technology, and applications of superconducting RF, including leading SRF accelerator projects, such as European XFEL, European Spallation Source(ESS), Facility for Rare Isotope Beams(FRIB), and Linac Coherent Light Source-II(LCLS-II) project. I am very pleased to learn about the most updated progress in the European XFELSRF cavity and cryomodule construction. As it is shown in the figure presented by Olivier Napoly (CEA/Saclay on behalf of the European XFEL), the most recent cryomodule test result is nearly achieving the ILC SRF design goal of an individual vertical cavity gradient of 35 megavolt per metre (MV/m) and an average grading of 31.5 MV/m after assembling into the cryomodule. The European XFEL XM59 cryomodule has nearly demonstrated these technical goals. 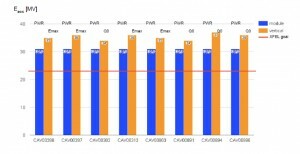 And the reached 31 MV/m were not limited by the performance but simply because of the operational limit at the test facility including operational safety margin. We would like to express our sincere congratulations to whole the European XFEL collaboration for the exciting progress after the hardest effort integrated. The result really demonstrates that the ILC SRF technology is getting ready for the ILC to go forward. The SRF cavity gradient achieved in the European XFEL Cryomodule XM59. I am also very much pleased to add my personal impression from the SRF conference. The field of SRF is offering many interesting subjects in basic science and advanced technology such as basic surface phenomena and thin film technology. Many impressive research projects and developments have been carried out with a fresh and young generation. Many discussions have been exchanged even though all the sessions were plenary with a few hundred participants with keeping very high spirit for the promising advances. Special thank is for Dr. Robert Laxdal of TRIUMF, conference chair, and his team having excellently organised the conference.